We’d love your help. Let us know what’s wrong with this preview of Don't Throw It, Grow It! by Deborah Peterson. Don’t throw out your kitchen scraps — grow them! Discover how you can transform leftover pomegranate seeds, mango pits, and dried bits of gingerroot into thriving plants. From the common carrot to the exotic cherimoya, you’ll be amazed at the gardening possibilities hidden in the foods you eat. To ask other readers questions about Don't Throw It, Grow It!, please sign up. Be the first to ask a question about Don't Throw It, Grow It! My dad always grew a series of avocado plants from the pit in water in the windowsill of our kitchen. I've always been the type to buy seeds and starts at a greenhouse or nursery, but when I saw this book, I thought I should give it a chance. I had a difficult time reading this book because, for some reason outside the realm of human understanding, my kitten fell in love with me suddenly while I was reading this. I read a lot, so it was definitely not the normal "cat thing" of trying to sleep on My dad always grew a series of avocado plants from the pit in water in the windowsill of our kitchen. I've always been the type to buy seeds and starts at a greenhouse or nursery, but when I saw this book, I thought I should give it a chance. I had a difficult time reading this book because, for some reason outside the realm of human understanding, my kitten fell in love with me suddenly while I was reading this. I read a lot, so it was definitely not the normal "cat thing" of trying to sleep on your book. She was literally throwing her body into my arms, purring wildly, and kneading my arm with her razor sharp claws. Has anyone else experienced temporary demonic possession in their cat while reading this book? Just curious. Separate from the cat issue, this little book is so entrancing. Certainly, some of the items are geared toward producing decorative ornamentals, not food producing, but I was pleasantly surprised to find a fair number of suggestions for plants that would produce real food. The instructions are clear, the illustrations are darling. Starting plants from food scraps is kind of a hit-or-miss method, so you need to be a little relaxed and open to the adventure to figure it out. The authors cover plenty of familiar food-to-houseplant items, but there are also a ton of more exotic and exciting suggestions. There are 68 plants (as per the title), but at least half were totally novel to me. Here's a list of things I am excited to grow after reading this book, even though I should have read it several months ago so I could have integrated it into my 2009 garden. I'm trying not to be bitter about the lost opportunity & just be glad I didn't miss the 2010 growing season as well. It did make me want to experiment with all sorts of fruits and vegetables I have in my kitchen, but they would mostly not fit on my kitchen window sill and would take a lot more effort than I want to give. And they mostly don't bear any sort of fruit in the end, so it's not actually growing food. But, on the other hand, it is growing interesting kinds of houseplants for free, so there's that. I frankly expected more from this plant book. Sure, it has a unique spin in that all of these plants can be grown from kitchen scraps on your windowsill. However, there are no photographs and each entry only comes with the bare minimum of information. More hints and growing tips, photos, and information about the plants would have made this so-so book an excellent reference. Sadly, this book did not fulfill how to grow your own vegetables and herbs from existing foods/plants. It's more for growing your own decorative plants and less about anything harvestable. Total disappointment. That said, it's well written, and does offer good advice for what it is. Just don't misunderstand its purpose like I did. This book would be infinitely more useful if they indicated which plants can be grown just for fun (that avocado seed will not grow into a avocado producing plant) and those that actually produce food you can eat. "Scraps" isn't quite the right word here. Sure, some of the things are legitimately scraps, but others you have to buy one if you want to grow it--you can't grow it from what's left over after you cook it/prepare it. Even so, it's an interesting book and I learned quite a bit about growing things like avocados and dates from leftover seeds. I felt like this book promised more than it delivered. I thought it would have more pointers for regrowing foods from kitchen scraps, but it was mostly about how to grow exotic fruits and vegetables for ornamental purposes. That's not really "kitchen magic" in my opinion. Aww man, not what I thought. I guess I should have read the title better. This is a great how to on growing unique houseplants from scraps. If that is your desire, then read this one! "A fabulous exercise in resourcefulness and recycling for the green thumb set, Don't Throw It, Grow It! 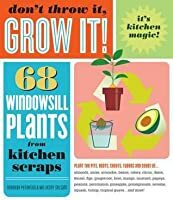 : 59 Windowsill Plants From Kitchen Scraps, the popular mid-seventies tome by Deborah Peterson and the late Millicent Selsam, was recently re-released by Storey Publishing, much to the delight of DIY foodies and gardeners everywhere. This beautiful reprint is as much the essential urban gardener's handbook as it was over 30 years ago. Filled with retro-style illustrations and simple-to-follow i "A fabulous exercise in resourcefulness and recycling for the green thumb set, Don't Throw It, Grow It! : 59 Windowsill Plants From Kitchen Scraps, the popular mid-seventies tome by Deborah Peterson and the late Millicent Selsam, was recently re-released by Storey Publishing, much to the delight of DIY foodies and gardeners everywhere. This beautiful reprint is as much the essential urban gardener's handbook as it was over 30 years ago. Filled with retro-style illustrations and simple-to-follow instructions, Peterson actually makes us believe that "there is no such thing as a green thumb." From instructions on building an indoor grow light to how much water to give your growing plant, it's one quarter gardening handbook and three quarters step-by-step manual, but also chronicles the horticultural adventures of these two ladies through ethnic markets, farm stands, and their own backyards. Any sophisticated gardener who pushes this book aside as a beginner's guide would be doing themselves a huge disservice." Some good ideas and basic guidelines/encouragement to experiment with all kinds of fruits, nuts, and legumes out of local and ethnic groceries in indoor pots. I'm going to try lentils, almonds, peanuts, coriander, sesame, and chickpeas. I've had poor luck with fruiting plants in my north-facing windows (avocados! ah! ), but it'll be a good late winter inspiration to sprout random dry goods around the house, and to get some legumes going in the pots, green manure for veggies in the summer. I've be Some good ideas and basic guidelines/encouragement to experiment with all kinds of fruits, nuts, and legumes out of local and ethnic groceries in indoor pots. I'm going to try lentils, almonds, peanuts, coriander, sesame, and chickpeas. I've had poor luck with fruiting plants in my north-facing windows (avocados! ah! ), but it'll be a good late winter inspiration to sprout random dry goods around the house, and to get some legumes going in the pots, green manure for veggies in the summer. Somewhat disappointed in this incredibly cursory handling of the topic of seed saving. While this book list some bare minimum statistics about most of the plants (for example "bright light, low light"), it doesn't talk about temperature requirements (another example: regardless of how much light tropical and sub tropical plants get, they need to be kept above certain temperatures--frequently temperatures that are much, much, much high than freezing) so if you live in the north it's unlikely you w Somewhat disappointed in this incredibly cursory handling of the topic of seed saving. While this book list some bare minimum statistics about most of the plants (for example "bright light, low light"), it doesn't talk about temperature requirements (another example: regardless of how much light tropical and sub tropical plants get, they need to be kept above certain temperatures--frequently temperatures that are much, much, much high than freezing) so if you live in the north it's unlikely you will be able to afford to keep your heater high enough to make certain plants produce actual goof, and none of that info is listed. This is the greatest impulse buy I've made in years! It's an entertaining, quick reference to things you can grow in your kitchen. There aren't any revelations here, but if you have kids or don't think you have a green thumb (like me) this is great fun. It's taking me back to my school year 'science project' days: watching roots grow from a sweet potato that we didn't get around to eating and creating table-pieces out of sprouting garlic. Not recommended for people know how plants work and alread This is the greatest impulse buy I've made in years! It's an entertaining, quick reference to things you can grow in your kitchen. I was not so much disappointed in the book by how apparently difficult it is to grow plants from kitchen scraps. Really you have to buy a whole second plant to grow and on top of that, most of these plants will not flower or fruit inside, or in the climate of my house, or if you don't already have a good base of gardening knowledge. Definitely a better for book for those interested in doing a bit more intensive gardening or growing more exotic plants. I haven't tried to grow any of the plants in this book, but this inforation it provides inspired me to try to do a little gardening this summer (some in the ground and some on windowsills.) With zero gardening experience to speak of, I've grown yellow pear tomatoes, grape tomatoes, green onions, bell peppers, and some sort of mysterious squash vine (that never grew fruit). None of these plants were grown form store-bought seeds or seedlings. it has it good parts and it's not so good. There are a lot of exotic fruits, nuts etc that while cool to learn about I have never seen so would never grow. The tips for growing the most common things were good. They had a lot of options for planting. Overall a decent book if you are interested in planting from pits, seeds etc. This wasn't what I expected - I was looking for something more of a tutorial and this was more of an encyclopedia, but that said, it was an interesting little book. It has entries telling a little bit about different fruits, vegetables, nuts, herbs, etc. and then explains how you can grow them from the produce you bought from the store. i love the style of the illustrations done in this book with its 50's retro approach and the design of the book is very nicely done. its well organized and very easy to follow. it makes me want to try it out and it also makes me curious about the adventures that these two women had. i love the idea of trying out new foods and then planting them! As many others have said, this book didn't live up to the expectation I had for it, mainly that I would learn how to grow edible things from previously edible things. I didn't finish it, and just skimmed through after I realized this, but the author barely touches on harvesting any actual food and merely comments on what type of (decorative) houseplant the food scrap will make. A fun, interesting book that will make you think twice about discarding old fruit or nuts. Most of the plants described in this book are simple to grow and produce attractive foliage. If you are looking to actually grow fruit or vegetables, not all of the entries will be beneficial. this can be paired with another of my books called Linnea's windowsill garden. I love kitchen/window gardening. this book rocks bc it has diff sections by region and wierd exotic grocery store fruit/vegg that you can grow funky vines and plants at home. my windows are full of them! Don’t Throw It, Grow It! 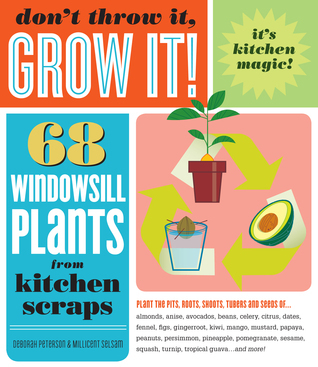 Sixty-Eight Window Sill Plants From Kitchen Scraps by Deborah Peterson and Millicent Selsam (Storey Publishing 2008)(635.0). Elementary instructions on growing free plants from kitchen scraps. My rating: 7/10, finished 2009. Really interesting! A lot of these plant profiles are geared more towards a green and flowering specimen than towards getting anything you can actually eat, but still. The book walks the perfect line between being concise and giving you new, useful information. I love this book. It has all sorts of information on what you can grow from items in your kitchen. I wish I had read the lychee section a week ago when I planted my pits but I will definitely use it to re-try avocado and to plant some fenugreek and mustard seeds. A great, fun book that opens your eyes to all the treasures hidden in your kitchen that are waiting to be grown.